THE UNPLEASANT taste of misfortune filled the mouths of the Saints at the Links on Saturday as visitors Orkney claimed all three points in a match that wasn't short of talking points. This game was originally scheduled to be played on the opening day of the season, and manager Stuart Ross may have wished it had been, with first team regulars John Skinner, Joe Sutherland, Jamie Skinner and top scorer Jon Campbell all unavailable or nursing injuries. Trialists Alan Davis and Ewan Ross were brought in the squad, along with new signing Sam Beeston and the returning Graham Noble, who were both looking to make their debut. 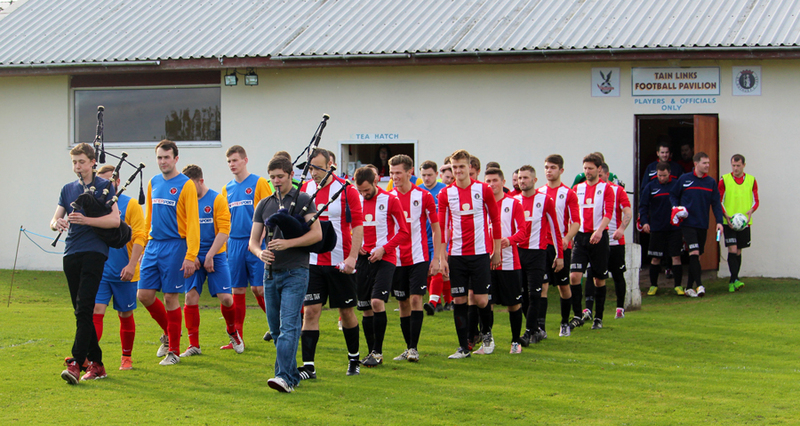 The teams were played onto the park by two young pipers of the Tain Pipe Band, namely Marcus Ross and Fraser Dunoon, before assembling alongside the match official and teams across the half way line. The performance was met with a round of applause before play commenced. St Duthus took the lead in the first minute of the game. A lively start from Orkney was ended abruptly when the Saints hit brilliantly on the counter, allowing Lewis Ross to play a deadly through ball to Paul Cowie. The midfielder was brought down in the box after his quick feet deceived the islanders' stand in goalkeeper Graeme Horne and referee Molly Alexander awarded the Saints a penalty. For the second time this season, Lewis Ross sent the ball home from the spot to give St Duthus a 1-0 lead. 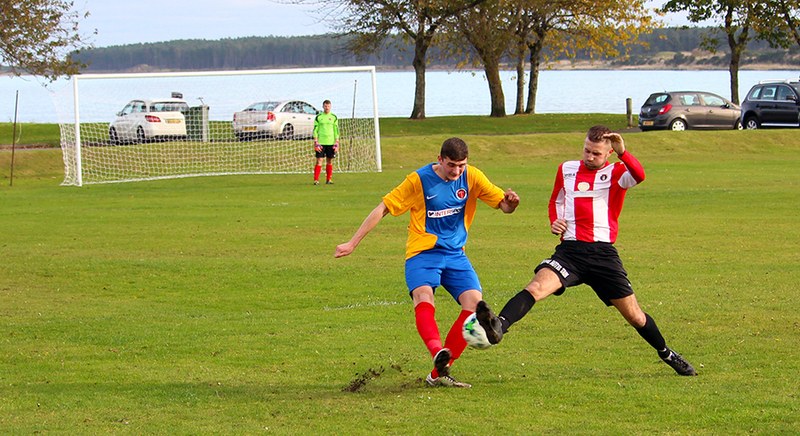 Orkney continued their push to score early on, shooting wide and firing into the stansion as they looked for a goal. 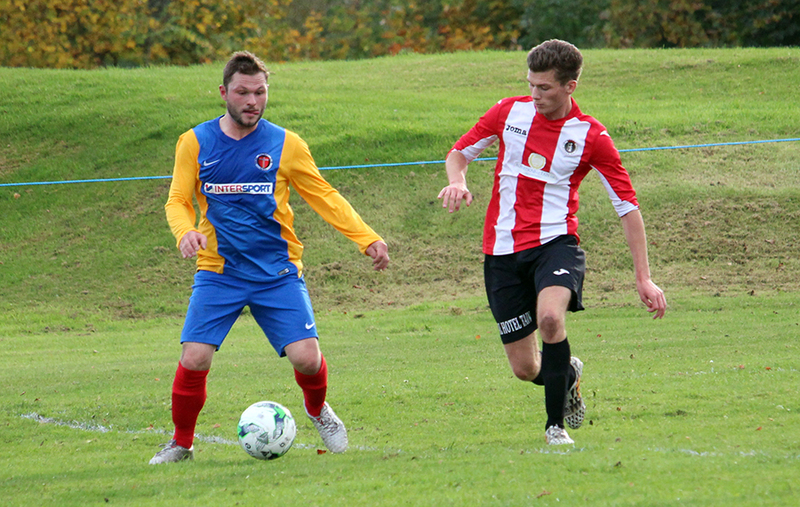 Within seven minutes though, the scores were level - and in controversial circumstances. The referee stunned onlookers when she awarded Orkney a penalty in return, after the ball had hit the midriff of a static Will Ross just inside the area. Chris Simpson did the honours for Orkney to level the scores, amidst a series of disbelieving cries from the Saints contingent. If St Duthus had been unlucky with the earlier penalty award, they were granted some fortune moments later when a mistimed challenge by Garry Macleod sent Thorfinn Stout crashing to the ground in the eighteen yard box before the ball was cleared to safety. Horne had to be on his toes on the fifteen minute mark when Jake Lockett forced the Orkney stopper to punch the ball clear with a cross-come-shot. Moments later, Steven Martin was forced into his first save of the afternoon for St Duthus when Orkney's Mark Berry saw his effort prevented after being played through on the home goal. Orkney had enjoyed the lion's share of possession as the first half continued, testing the homester's back line with a series of corners and direct balls into the box. Reacting well on the break for the Saints though, Scott Miller proved to be a unwavering pest to the visitors after dropping back, working tirelessly behind Lewis Ross to capitalise on the visitors' mistakes and break up play. From a Will Ross free kick on the 40 minute mark, Alan Davis sent a stunning volley towards goal which drew a terrific save from Horne - albeit after the referee had blown the whistle for a foul. The first half drew to a close with Orkney the better of the two sides, showing great persistence up front. In the face of Orkney's persistence, St Duthus had defended well, with Garry Macleod a particular highlight. Saints manager Stuart Ross made swift changes during the break though, with Sam Beeston and Graham Noble both making their first team debuts from the bench. St Duthus reemerged for the second half with a renewed approach, and following a series of corners, they found themselves unlucky not to have taken the lead. Cammy Mackintosh was the man with the final touch on a Paul Cowie corner when he sent a curling effort towards the target, but Horne again produced a superb reaction save, tipping the ball over the crossbar. The Saints' persistence continued for the first half of the second period, and Lewis Ross and Garry Macleod were both unlucky not to put St Duthus ahead, with chances thwarted by a series of clearances and blocks. Penalty was the cry again on sixty minutes when Scott Miller shot towards goal and the deflection from a defensive block just in front of goal bounced up and appeared to strike the arm of Orkney's Owen Rendall. Alas, there was to be no third spot kick - much to the consternation of the Saints touchline, who expressed their displeasure with the official's decisions, and not for the first time in the game. A thorn in the side of the Orkney defence throughout the match, Lewis Ross bettered the back line to get on the end of a ball over the top, but his first time shot flew into the arms of Horne. Despite sustained pressure from the Saints amidst a good spell, a goal eventually arrived on 67 minutes, and in deflating circumstances. An Orkney corner, only partially blocked by the head of Cammy Mackintosh reached Orkney's Mark Berry and his nodded effort beat the reaching hands of Martin and found the net. Expectedly, the away side took heart from their fortuitous goal and were now playing with their tails up, and were it not for some solid defending and perseverence from the Saints men, Orkney may have snatched a third goal. With fifteen minutes left on the clock though, Liam Rostock was introduced and his dangerously long throws came into effect as the Saints chased an equaliser. Scott Miller, tenacious for the entire ninety minutes, was particularly unlucky with a volley low into the arms of Horne after a clearance from a throw. On the counter, Orkney should have made it 3-1 when substitute Martin Wishart connected with a cut back, but Graham Noble's goalline clearance was made easy by the striker's lacklustre tap in. St Duthus were not set to lay down yet though, and substitutes Sam Beeston and Michael Newlands were both unlucky with crosses late on as the homesters pushed everything forward in search of at least a point. It was a case of too little too late though, in a game that really could have gone either way. The loss, St Duthus's third in as many scheduled games, sees them drop into the bottom half of the table, just below Halkirk United on goal difference and falling behind an in-form Golspie Sutherland who made sharp work of Inverness Athletic at home. Steven Martin, Adam MacDonald, Will Ross, Cameron Mackintosh, Garry Macleod, Ewan Ross, Alan Davis (Graham Noble 46), Paul Cowie (Liam Rostock 75), Scott Miller, Lewis Ross (Michael Newlands 70), Jake Lockett (Sam Beeston 46). Sub not used: Steven Learmont. 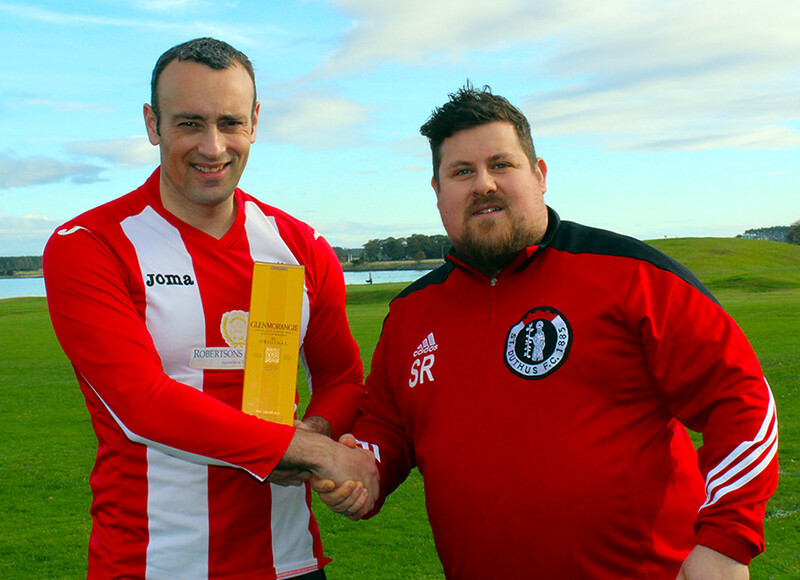 Yesterday's match was sponsored by Forbes Jewllery, Tain. Click the image below for our Flickr gallery of the match. Photos taken by Niall Harkiss.